FÜRTH - In the Stadttheater she showed her paintings almost three years ago. Now new works by Ute Plank can be seen in the Sparkasse Fürth - an examination of the most current topics. The pictures are playful, but not silly. They quote, satirise and copy, put figures in new contexts and alienate their statements. 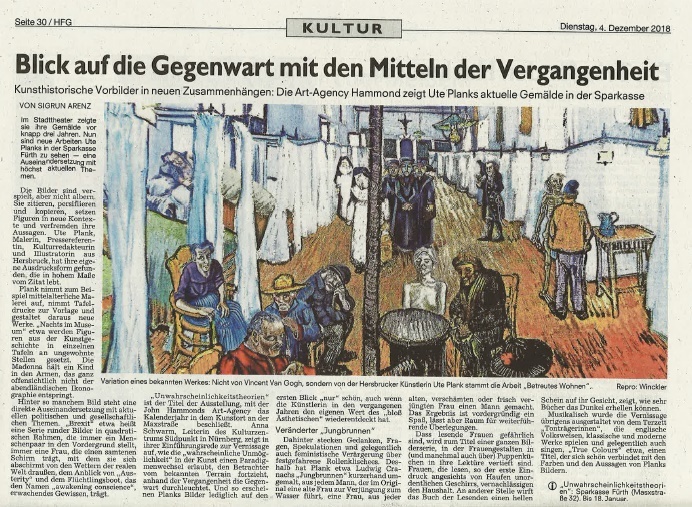 Ute Plank, painter, press officer, cultural editor and illustrator from Hersbruck, has found her own expression, which lives to a great extent on the quotation. For example, Plank takes up medieval painting, uses plate prints as a template, and uses them to create new works. “At night in the museum”, for example, figures from the history of art in individual panels are set to unfamiliar places. The Madonna holds a child in her arms, which obviously does not spring from occidental iconography. Behind many a picture is a direct examination of current political and social issues. For example, “Brexit” is a series of round images in square frames that always emphasize a human couple, always a woman wearing a velvet umbrella shielding her from the real-world beaters outside, the sight of “austerity “and the refugee boat, which bears the name” awakening conscience “. ”Non-Probability Theories” is the title of the exhibition, with which John Hammonds Art-Agency closes the calendar year in the art venue in the Maxstraße. Anna Schwarm, director of the Kulturzentrum Südpunkt in Nuremberg, shows in her introductory speech at the vernissage how the “probable impossibility” in art allows a paradigm shift, moves the viewer away from the familiar terrain, uses the past to illuminate the present. And so, Plank’s pictures appear “only” beautiful at first glance, even though the artist has rediscovered her own value of the “merely aesthetic” in recent years. Behind this are thoughts, questions, speculations and occasionally feminist annoyance about deadlocked stereotypes. That’s why Plank has simply re-painted Ludwig Cranach’s “Jungbrunnen” (“fountain of youth”), from a man who in the original leads an old woman to rejuvenation to the water, a woman, made a man out of every old, shy or newly rejuvenated woman. The result is superficially fun but leaves room for further reflection. The fact that reading women are dangerous becomes the title of an entire series of pictures in which female figures in (and sometimes also above) doll kitchens are absorbed in their reading. Women who read, so the first impression in the face of heaps of messy dishes, neglect the household. Elsewhere, the reader’s book casts a bright glow on her face, showing how much books can illuminate the darkness. Incidentally, the vernissage was musically decorated by the trio “Tonträgerinnen”, who play and occasionally sing English folk tunes, classical and modern works, “True Colours”, a title that blends beautifully with the colours and statements of Plank’s paintings. It is the privilege of art to disregard or reshape reality in order to denigrate it with a deeper meaning. Ute Plank shows new works created in the master class Rosa Loy and their playful variations of well-known works of art.